Find the least number of cuts required to cut a cube into 125 small identical pieces. 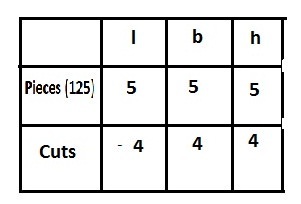 Number of cuts = 4+4+4 = 12. There are 3 dimensions to a cube. It requires 4 cuts per each dimension to get 5 equal sized pieces for each dimension. Thus it takes 12 cuts to get 125 equal sized pieces. But answer is 125, how? this all depends on what's allowed for a "cut". I would make 4 cuts, holding the slices in place, rotate it about the y axis 90 degrees, and repeat, then rotate it about the z axis and repeat. This is 12 total cuts. If you're given an answer of 125 it seems they don't allow that and that a cut must operate on one solid piece only. So you would cut the cube into 5 square slices with 4 cuts. Then for each slice you would cut it into 5 rectangular slices with 4 cuts per square slice. Then for each rectangular slice you would cut it into 5 square pieces using 4 cuts. I don't know where the last cut comes from. I think the answer is 124.